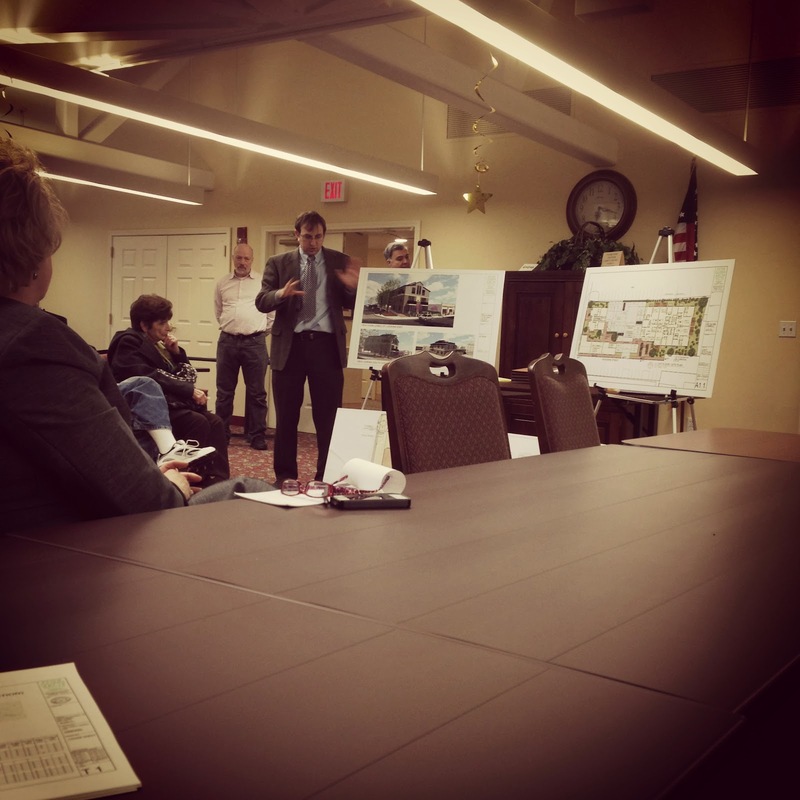 Proposals for 231 and 235 Lowell Street were the subject of the first 2014 community meeting in Ward 5 on Thursday January 16th in the 3rd floor community room of the VNA. Ed Doherty, who has completed projects on Albion and Hudson Streets and is finalizing a development on Highland Avenue was in attendance to field questions on how his project at the 235 location would compliment the larger proposal for 231. The developer for 231 was identified as Steve Caruso at the meeting and the current suggestion is to include 19 housing units with a work space for residents located on the first floor. Caruso was not in attendance. Although the 235 project has been before the Zoning Board of Appeals twice, resident concerns have blocked approval. The project is now on the docket for this Wednesday's meeting. 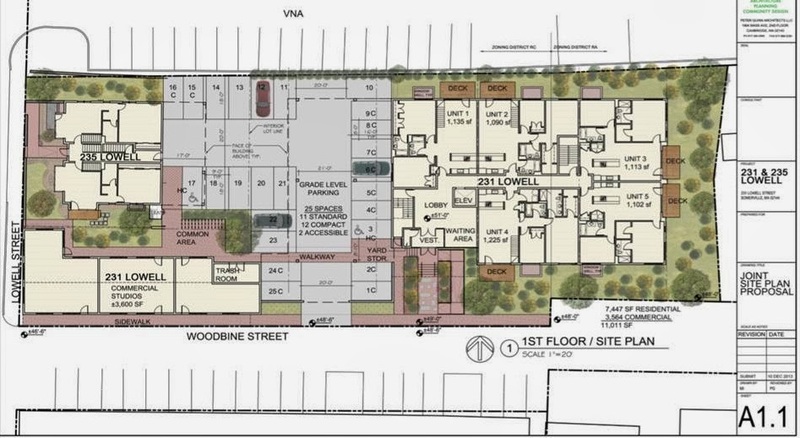 One major element of the 231 development that is receiving the most push-back is a shared driveway to enter and exit both locations to be located on Woodbine Street (See joint-site plan above). Designated as a Private Way and connecting to Centre Street, Woodbine is home to residents and abutting businesses. Both residents and business owners are opposed to the driveway being included on the street noting that it is already narrow, plagued with parking issues and being used by large trucks for one of the businesses. The second business also uses the side of their building to accommodate work trucks. The architect for the project, Peter Quinn, did inform residents that he is still working out the details on many renderings-at least one of which will have the main entrance and egress located on Lowell Street. Traffic mitigation for the projects was also suggested as Lowell Street has seen increased use and has been the subject of safety concerns in the past few years (2010, 2011, 2012, 2013). City Planner, George Proakis, is planning a full parking study for this and other areas of the City as, Proakis pointed out, parking needs are changing due to housing's close proximity to businesses and other transit opportunities including the Community Path, Green Line Extension and Zip Car. Should the shared driveway be approved for Woodbine Street, Doherty would then be able to landscape the driveway he had planned for 235, located between the building and the VNA. According to the joint-site plan above, the 231 property line would be brought back a few feet to make way for a sidewalk that, although located on private property, would be made available for public use. More detailed plans on 231 Lowell Street were not available at the meeting. Although Doherty's 235 project was the focus, residents took advantage of the opportunity to voice their concerns for the adjacent property, 231, as both projects share the same architect and attorney. Plans for future community meetings on the 19-unit project at 231 Lowell Street have been promised, but not yet scheduled as formal renderings and building layouts are still being finalized. All details will be published as soon as they are made available.